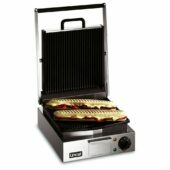 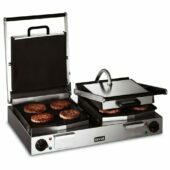 We have a great selection of contact and panini grills, which are suitable for a wide variety of different kitchen sizes. 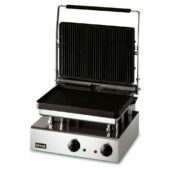 Whether you're looking for a single grill, or you wish to utilise a twin-grill setup, we've a grill more than capable of fulfilling your requirements. Now you can produce an incredible mix of delicious paninis or perfectly grill succulent meats. 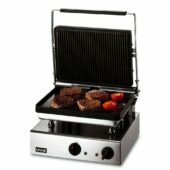 These grills are available as flat or ribbed versions, depending on what you need to cook. 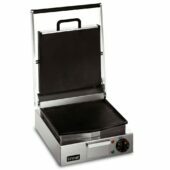 The flat version produces an evenly balanced cook time after time, whereas the ribbed version will provide a distinctive yet attractive branding to your cooked foods. 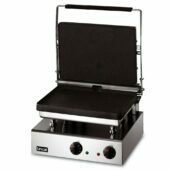 We produce both the high powered models and twin head models, which are particularly ideal for higher volume output requirements. 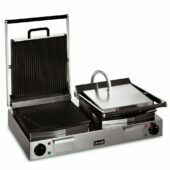 Each units sleek styling yet compact design means that they're ideal for front of house use, due to their smaller footprint and ease of use.